Christmas Pork wouldn’t be same without Apple Sauce. Before you reach for a jar or tub of the pre-prepared stuff, check out our easy recipe to make your own. Peel and core the apples and cut in to 3cm cubes. 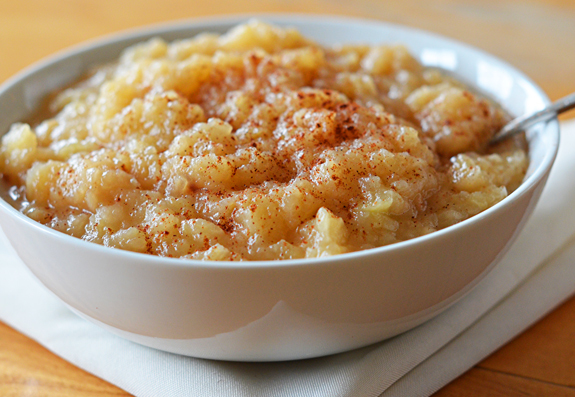 Bring apples, water, sugar, zest, and cinnamon to a boil in a heavy saucepan, stirring occasionally, then reduce heat and simmer, covered, 15 minutes. Stir occasionally to make sure the sauce doesn’t scorch. Remove lid and simmer until most of liquid is evaporated, about 5 to 10 minutes. Mash apples with a potato masher or a fork to a chunky texture*, then cool, cover and refrigerate until ready to serve. * If you prefer a smoother texture, pour everything in to a food processor, and blitz for a few minutes. Sour green apples work best – Granny Smith is a good bet. Making this sauce should be a quick and easy process. If your apples need to cook for longer than 30 minutes, your pieces are too big. Overcooking your apples is a big no-no as apples lose their flavour the longer they’re cooked. Avoid using white sugar as your sweetener. It will make the sauce too sweet and you won’t get the tasty caramel flavours we associate with good applesauce. Err on the side of less-is-more with your sweetener. If once cooked and cooled it’s not sweet enough for your liking, you can add some maple syrup or honey. Add a hint of lemon zest for an interesting and unexpected zing! The sugar in the sauce acts as a preservative so this sauce can easily be made, and ticked off your to do list, a few days before Christmas Day.